A perfect Isibisi pasta dish can be prepared and served in just 60 seconds without requiring SPECIALIZED LABOR and in total automation with this new Pasta machine. Taking up only 30 inches of space, this Pasta machine makes it possible to prepare 240 first courses in just one hour. It is entirely made of stainless steel. Electronic temperature and time control, interactive chart, counter for the number of dishes cooked in order to monitor productivity. The new Voglia di Pasta machine, is ideal for COOKING gluten-free products and ensures absolute safety for allergic and intolerant people. It is designed to be used in commercial environments such as restaurants, cafeterias and bars where there is a risk of contamination, but above all for occasional locations such as food trucks, catering for parties and ceremonies, fairs, and demonstrations. Thanks to state-of-the-art technology, the new product makes it easy to prepare an excellent pasta dish in minutes. The only equipment required is a counter and an electrical outlet. The machine is available in two versions: the smaller version has two bins, is 30 inches wide and prepares up to 120 pasta dishes in 1 hour; the larger version has four baskets, is recommended for larger scenarios, and can prepare up to 240 pasta dishes in 1 hour. Voglia di Pasta is totally automatic and easy to use, and makes for considerable savings in time and effort: just load the drum and press a button. 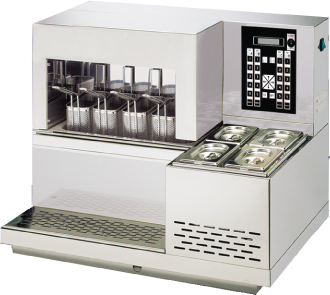 It is equipped with an automatic water bath which makes serving up to four different sauces possible, and a patented vapor aspiration system that allows its use without aspiration hood.